When your cruise ship docks in Reykjavik, explore Iceland’s famous Golden Circle route and see the best of the country’s natural beauty in one day. 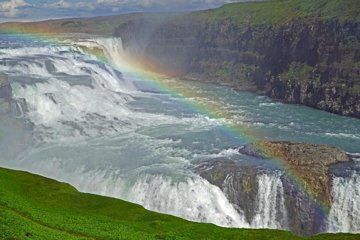 Travelling in comfort by air-conditioned minivan, reach remote natural attractions including Gullfoss waterfall and the UNESCO–listed Thingvellir National Park. Watch powerful geothermal geysers exploding hot steam into the air at Strokkur, and admire sweeping views over the rugged wilderness scenery.